CampControl distinguishes between exploration staff and expediting staff because the expediting function is often contracted to a service provider outside of the exploration company. The CampControl system is therefore available in two versions: CampControl Exploration and CampControl Expediting. The CampControl Exploration system is for exploration companies which either manage their own expediting, or which use an expediting company which does not have use of its own CampControl system. The CampControl Expediting system is for expediting companies which wish to provide expediting services for multiple exploration companies using CampControl. 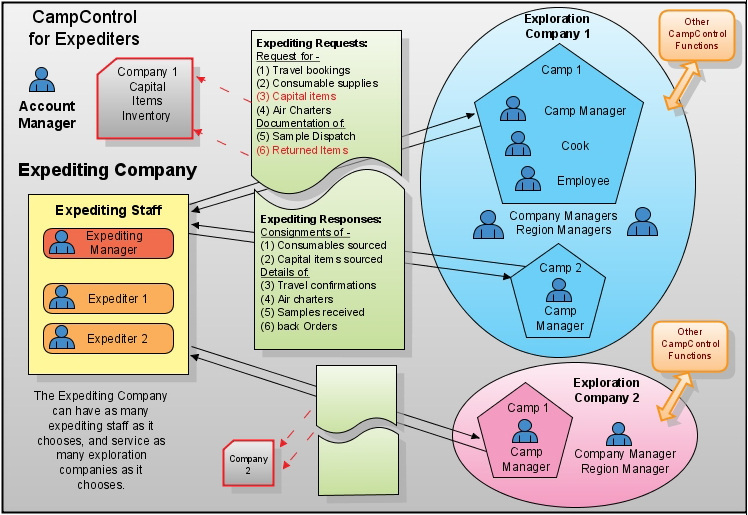 If an expediting company wishes to service only one exploration company with CampControl, it could choose to use CampControl Exploration for this purpose. The only difference between the two systems lies in how data access permissions are managed. 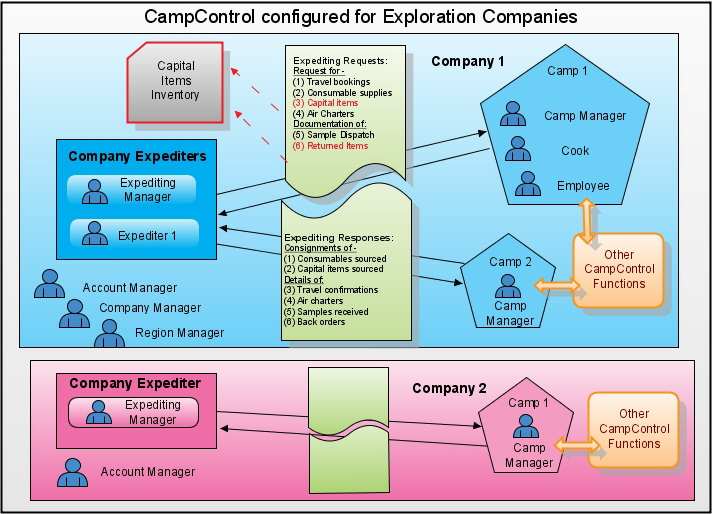 In CampControl Expediting the account is managed by the expediting company and the Expediting Manager(s) has access to data belonging to all the companies in the system, while exploration company staff can access only data belonging to the exploration company to which they belong. In CampControl Exploration the account is managed by the exploration company. The Expediting Manager(s) has access to all data in the system, as does the exploration company manager(s), but there can never be more than one company within the account. Since Company Managers in CampControl Exploration have all the permissions of Expediting Managers, a very small exploration company can operate CampControl Exploration without creating a user at the level of Expediting Manager by simply having all the expediting activities carried out by the Account Manager, or another Company Manager.